Advantages: Succinct narrative; informative and engaging operational history of the type; sharp, clear and relevant photos; logical structure; attractive illustrations. 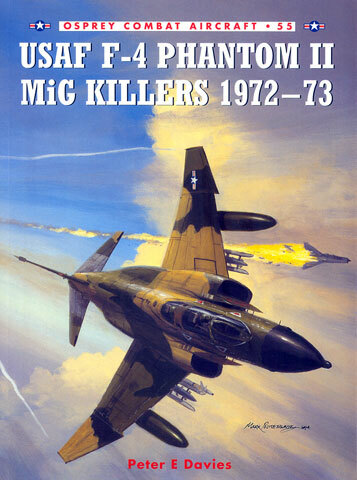 USAF F-4 Phantom II MiG Killers 1972 – 73 is the latest release from Osprey Publishing and is number 55 in their Combat Aircraft Series. The title of this book is a bit of a misnomer. Perhaps it should have been titled USAF F-4 Phantom II Operations 1972 – 73 – The MiG Killers, because that is what the book is all about. As well as describing the actual MiG killing missions flown, it also provides a complete history of the USAF operations during the air war over Vietnam during this period. It's all there in exact and precise detail; the call signs used, the people involved – the ground crew personalities as well as the pilots/RIOs, the equipment used, the tactics, everything! USAF 4 Phantom II MiG Killers 1972-73. Meat and potatoes stuff here, it is a complete list and includes details on the date of the kill, the MiG type, the type of F-4 used by its serial number, its Wing Code marking, the crew, the call sign of the aircraft, and the weapon used in the shoot down. Scale drawings (in 1/96 scale). These cover early and late build F-4Ds and Es. A description of the 27 colour plates. Captions to the 17 colour photographs. The book also contains twelve pages that hold 27 colour profiles. These profiles have been painted by Jim Laurier. 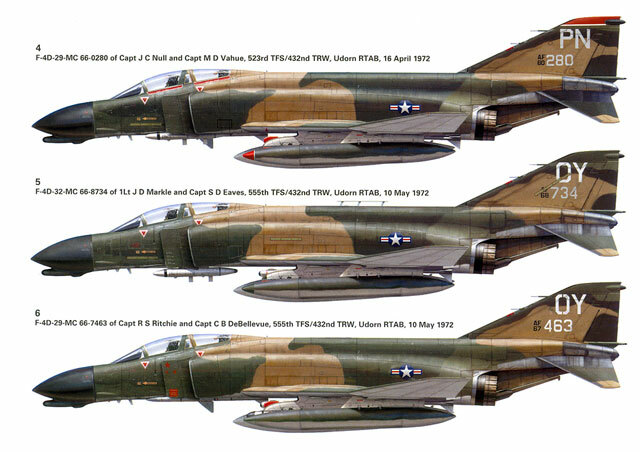 All of them show MiG killing F-4s in the South East Asia camouflage scheme of two greens and a tan over light grey under surfaces with appropriate squadron and individual markings. Further artwork appears on the front cover, this time by Mark Postlethwaite. The book is also very well illustrated with both colour (17) and black and white (83) photographs. As with the text, the photographs are a complete history of the period and include everything from the expected 'grip and grin' congratulatory shots to shots of patches worn by the participants. The book itself has 96 pages printed on glossy paper between thin cardboard covers and is the same size as the Aircraft of the Aces and Combat Aircraft series produced by Osprey. As far as I'm concerned, this is an excellent book. Not only does it record the circumstances of the MiG kills scored, it also gives you a full and complete picture of the air war over Vietnam in its final stages. Thankfully, Osprey has published this book. If it was from any other publisher in hardback, we would be paying a whole lot more for it! This book is aimed more at the enthusiast than the modeller. It will not help you with close-up detail shots of F-4s to help you detail your latest masterpiece. It does however give you an understanding of what it was like to fly the F-4 in combat in the final stages of the Vietnam War.